Service providers in the global GMP cell banking services market are focusing on offering innovative services to retain market share. For instance, key players in the global GMP cell banking services market are focusing on the development of new and innovative service models and expanding the existing capacity. Providers are also adopting innovative marketing strategies to gain market share. Balancing fixed costs while offering competitive pricing is a major focus area for vendors in this market. For example, biopharmaceutical companies are focusing on outsourcing the manufacturing of biologics to the APAC region in order to reduce their manufacturing costs and thus set competitive pricing. Another strategy that key players are adopting in this market is increasing storage capacity and offering end-to-end services across all the nodes of the value chain. Companies are also entering into mergers and acquisitions as well as partnering with small biotech startups to expand service offerings, capacity and market presence globally. In a new publication titled “GMP Cell Banking Services Market: Global Industry Analysis and Forecast, 2017–2025,” Persistence Market Research analysts have targeted five key geographies and have observed that North America represents the most lucrative market, followed by Europe and Asia Pacific. 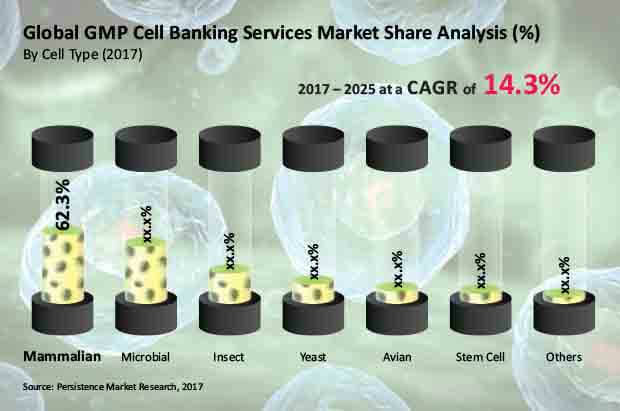 The GMP cell banking services market in MEA is expected to record comparatively less growth due to low awareness about these services and presence of limited manufacturing facilities. The main focus of this report is on the process workflow of cell banking services. Various checkpoints are in place during the overall cell banking process to ensure quality and consistency of culture, as well as on avoiding contaminants. To make this report an exclusive one, the expert team of analysts have given an optimistic scenario, likely scenario and conservative scenario. The analysts have segmented the market into two main categories – cell type and end user – and have analyzed these segments across the assessed regions. The report executive summary succinctly covers the market overview, overall market approach, target geographies and differentiating strategies of the global GMP cell banking services market key players. The executive summary section is followed by the market introduction and consists of a thorough description of the various types of cells. Mammalian segment dominated the global GMP cell banking services market in terms of revenue in 2016 and the trend is projected to continue throughout the forecast period. The mammalian segment is the most attractive segment with attractiveness index of 5 over the forecast period. The segment is expected to expand at 15.6% CAGR over the forecast period and be valued close to US$ 690 Mn by 2025 end. The mammalian segment accounted for more than 60% revenue share of the global GMP cell banking services market in 2016 and is expected to gain 556 basis points in its market share by 2025 over 2017. Mammalian cell type segment is projected to create absolute $ opportunity of more than US$ 30 Mn in 2018 over 2017. Revenue from the mammalian segment in the global GMP cell banking services market is expected to grow 3.2x by 2025 end as compared to that in 2017. Global biopharmaceutical companies are making a more significant commitment to outsourcing by striving to improve operating efficiency and increase pipeline productivity. Biotechnology companies and other private organizations have always preferred outsourcing to investing in internal infrastructure. Academic institutions are also partnering with biopharmaceutical companies to monetize innovation and acquire expertise in drug discovery and development. Some of the most promising new therapies are being discovered by small biotechnology companies supported by venture capital funds, capital markets as well as large biopharmaceutical companies. These companies are expected to continue to invest in their pipelines due to the continuing availability of funding. Additionally, biopharmaceutical companies prefer to outsource manufacturing in markets where they have limited expertise in various stages of the value chain, especially towards the end where a CDMO’s presence in a particular region gives them access to a vast distribution network, as well as knowledge of existing regulatory guidelines. These factors drive the growth of the global GMP cell banking services market. Large biopharmaceutical companies have several manufacturing sites that typically produce commercially marketed therapeutics as well as material for clinical development. As a result, the in-house capacity for storage of GMP cell banks is limited. Cell banking service providers have the required infrastructure in place, such as designated clean rooms and trained personnel, and also ensure adherence to regulatory guidelines such as ICH, thereby making them an ideal partner for biopharmaceutical companies. They are also able to provide in-house testing services or sub-contract these to certified testing laboratories. Limited in-house storage and testing capabilities are likely to fuel the growth of the global GMP cell banking services market. The mammalian cell type segment dominated the North America GMP cell banking services market in revenue terms in 2016 and is projected to continue to do so throughout the forecast period. The mammalian cell type segment is the most attractive segment in the North America regional market, recording an attractiveness index of 5.1 over the forecast period. The mammalian segment is also the most attractive segment by cell type in the Latin America GMP cell banking services market with an attractiveness index of 4.5 over the period of forecast. In the Europe GMP cell banking services market, revenue from the mammalian segment is anticipated to increase at a CAGR of 13.3% over 2017-2025 to reach more than US$ 200 Mn by 2025. The mammalian segment dominated the Asia Pacific GMP cell banking services market in terms of revenue in 2016, and the trend is projected to continue throughout the forecast period.